Blackeye Peas, Baby Limas, Tiny Green Limas, Large Limas, Pintos, Great Northerns, Red Kidney Beans, Green Split Peas, Yellow Split Peas, Lentils, Black Beans and Small Red Beans. Ham Flavor Packet Ingredients: Hydrolyzed Vegetable Protein, Monosodium Glutamate, Natural Hickory Smoke Flavor, Artificial Flavor and Less than 2% Tricalcium Phosphate added to prevent caking. Quick Method: Boil beans in water for 2 minutes. Remove from heat, cover and soak for one hour. Overnight Method – Boil Beans in water for 2 minutes. Remove from heat, cover and soak for 4 hours or overnight. Drain soak water and replace with 6 cups of fresh water, 1 cup of diced onion, and 1lb of meat. Bring beans to a boil, reduce heat, cover and simmer for about 2 hours. After simmering, add one 14.5oz can of diced tomatoes and cook for additional 30 minutes. Stir in contents of flavor packet 2 minutes before beans are done. Salt and pepper to taste if desired. Rinse beans, then place in crock pot with 5 cups water and one can of chicken broth. Add 1 cup of onion, diced and hambone or meat to pot. Once beans are tender, add one 14.5oz can of diced tomatoes and the contents of our Ham flavor packet. Cook for an additional 25-30 minutes, remove ham bone before serving and Enjoy! Salt and pepper to taste if desired. Is this product suitable for vegans if the label instructions are not followed to include meat? Are there any animal products in the seasoning packet? The seasoning packet does not have any ingredients that are made with or contain animal products. 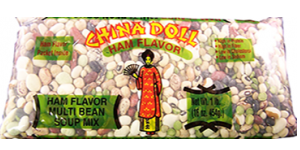 The ham flavor uses corn protein and a vegetable protein.